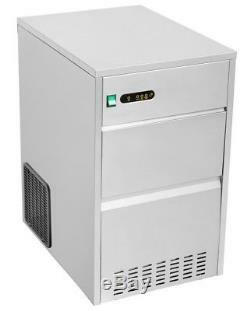 The Empire 50kg fully automatic commercial under counter ice machine is the perfect appliance for ensuring a reliable source of quality hard, bullet-shaped ice. It gives outstanding performance day after day which is perfect for busy bars, restaurants, pubs etc. This mains-fill machine works tirelessly to keep up with demand giving you a consistent output of ice. The compact under counter design helps to you to position the machine exactly where it's needed, whilst the generously-sized ice storage container makes access effortless. Easy to use, clean and maintain. Supplied with installation kit and handy ice scoop. Dimensions 400mm W x 540mm D x 670mm H. Finish - external 304 Stainless steel w/ galv rear plate. 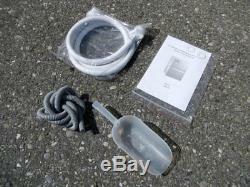 Supplied with scoop and installation kit. Adjustable feet allow easy positioning on uneven floors. Approximate ice dimensions: 40(H) x 26(W)mm - bullet shape ice. Dimensions (MM): 400mm W x 540mm D x 670mm H. Inlet pipe diameter (MM): 0.75. Production Per 24Hrs (KG): 50. 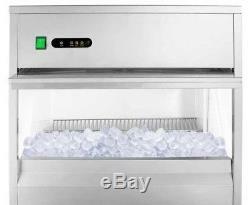 Commercial Under Counter Ice Machine Maker 50kg/24hr Restaurant Bar Pub Compact. We cannot specify a time of arrivial for these deliveries, however, you can specify the courier driver to telephone you an hour before arrival. This MUST be specified at time of order. Non mainland UK or Scottish highlands and Islands may be subject to charges. Costs stated for deliveries to Europe are basic guidelines. Higher charges may apply for Islands such as Malta and Cyprus and will be advised after the order is placed where appropriate. Don't get caught out, check the dimensions of your access points. In the unlikely event of transit damage, please notify us within 24 hours and sign the POD as damaged, so that we can ensure a speedy resolution. For electrical For electrical products we always recommend consulting a certified electrician if you are unsure of installing them and the electrical requirements for them. You have a duty to take reasonable care of the item(s) until we receive the item(s) back. Return posting costs will be at your expense. Any defective parts (excluding those listed below) will be replaced free of charge. It is the customers responsibility to get these parts fitted by a qualified engineer. Lamps, LED Strip Lights, Bulbs and Handles. The item "Commercial Under Counter Ice Machine Maker 50kg/24hr Restaurant Bar Pub Compact" is in sale since Wednesday, July 18, 2018. This item is in the category "Business, Office & Industrial\Restaurant & Food Service\Bar/ Drinks Equipment\Ice Makers". The seller is "empiresupplies2010" and is located in Wirral. This item can be shipped to United Kingdom.